Each vial contains 100 μg of NET peptide. Hiding in Plain Sight: Soluble Immunomodulatory Receptors. Alternatively spliced natural soluble isoforms of immunomodulatory receptors [cytotoxic T lymphocyte antigen-4 (CTLA-4), 4-1BB, and programmed death-1 (PD-1)/PD-L1] have been overlooked in favor of their cell-surface-bound counterparts that have generated blockbuster antibodies for the treatment of cancer. We propose that the soluble variants of these receptors contribute to immune regulation and offer potential as targets for immunotherapy. Dahal LN, Schwarz H, Ward FJ. Hiding in Plain Sight: Soluble Immunomodulatory Receptors. Trends Immunol. 2018;39(10):771-774. The soluble CTLA-4 splice variant protects from type 1 diabetes and potentiates regulatory T-cell function. OBJECTIVE: CTLA4 gene variation associates with multiple autoimmune disorders, including type 1 diabetes. The CTLA4 susceptibility allele was found to generate decreased levels of mRNA encoding soluble CTLA-4 (sCTLA-4) relative to the full-length isoform, the functional consequence of which is as yet unknown. In this study, we investigated the contribution of sCTLA-4 to immune regulation with the aim to elucidate the functional basis of the disease association of CTLA4. 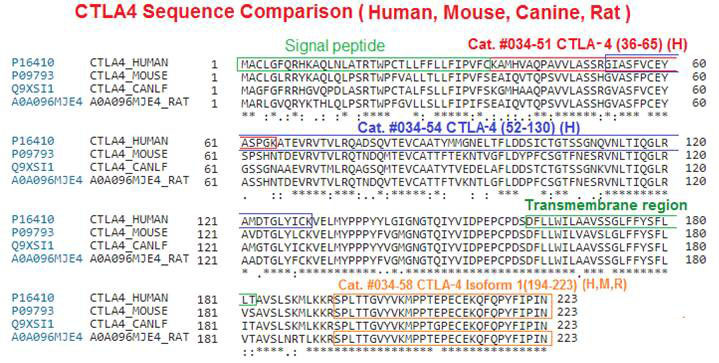 RESEARCH DESIGN AND METHODS: To model the disease-associated splicing variation of CTLA4, we generated NOD mice in which sCTLA-4 mRNA is silenced by RNA interference. RESULTS: We found that loss of sCTLA-4 impairs the function of regulatory T (Treg) cells. This functional defect could be attributed, at least in part, to the failure of sCTLA-4 knockdown (KD) Treg cells to downregulate dendritic cell costimulation. sCTLA-4 KD Treg cells, in contrast with wild-type Treg cells, failed to inhibit colitis induced by transfer of CD4(+)CD45RB(hi) cells into NOD.SCID animals. Furthermore, diminished sCTLA-4 expression accelerated the onset of autoimmune diabetes in transgenic mice. CONCLUSIONS: Our results demonstrate that sCTLA-4 participates in immune regulation by potentiating the function of Treg cells. 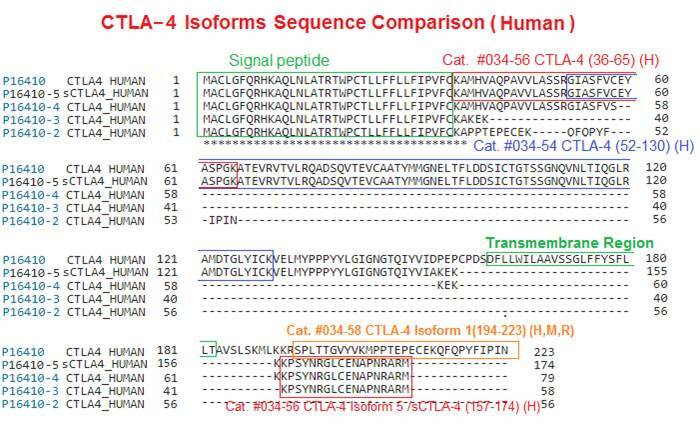 The functional outcome of silencing this splice variant in the NOD model provides an explanation for the association of CTLA4 variation with autoimmunity. Lower sCTLA-4 expression from the susceptibility allele may directly affect the suppressive capacity of Treg cells and thereby modulate disease risk. Our unprecedented approach establishes the feasibility of modeling splicing variations relevant to autoimmunity. Gerold KD, Zheng P, Rainbow DB, Zernecke A, Wicker LS, Kissler S. The soluble CTLA-4 splice variant protects from type 1 diabetes and potentiates regulatory T-cell function. Diabetes. 2011;60(7):1955-63. A native soluble form of CTLA-4. CTLA-4 is an immunoregulatory receptor expressed on the surface of activated T and B lymphocytes. The counterreceptors for CTLA-4 are the B7 family molecules. We describe alternatively spliced mRNAs expressed in hematolymphoid tissues of humans, mice, and rats that lack the transmembrane domain coded by exon 3 of the CTLA-4 gene. These alternate transcripts were detected by RT-PCR in B cells and resting T cells of both the CD4 and the CD8 phenotype. Activation of human blood mononuclear cells with PHA or anti-CD3 + anti-CD28 monoclonal antibodies appears to effect a decrease in the amount of the alternative transcript relative to the full-length transcript. Recombinant sCTLA-4 is a B7-binding protein and has immunomodulatory effects as measured by inhibition of the mixed leukocyte response. Human serum contains immunoreactive material consistent with a native soluble form of CTLA-4. Oaks MK, Hallett KM, Penwell RT, Stauber EC, Warren SJ, Tector AJ. A native soluble form of CTLA-4. Cell Immunol. 2000;201(2):144-53.